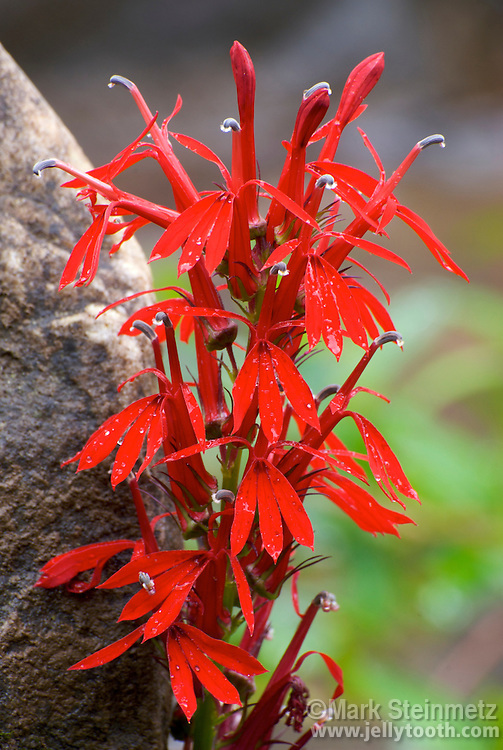 Close up of the intensely red terminal racheme of Cardinal Flower (Lobelia cardinalis), with dew drops on its petals. The plant's common name is believed to have come from the bright red robes and caps worn by Roman Catholic Cardinals. This tall perennial herb is a summer blooming wildflower native to North America, and a favorite of hummingbirds and many butterflies. Often found on streambanks. Youghiogheny River, Pennsylvania, USA.